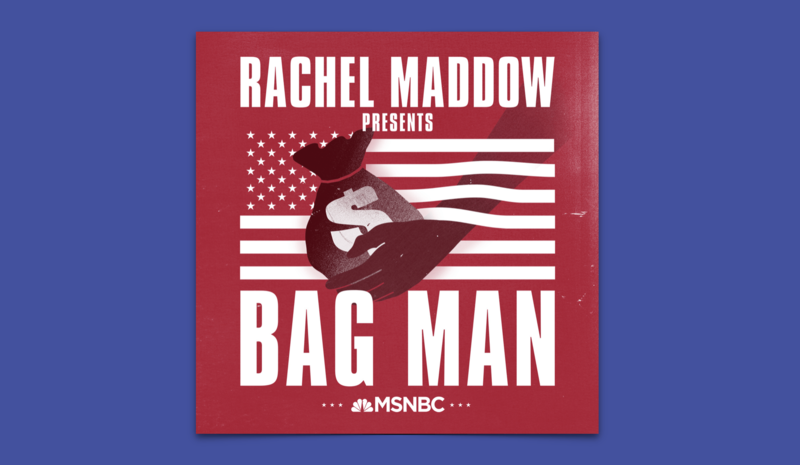 As she has done on her MSNBC show since 2008, Rachel Maddow lays bare her political angle from the outset of Bag Man, her podcast on the corruption and resignation of Richard Nixon’s Vice President, Spiro Agnew. On its face, this ideological clarity makes the show blunt and refreshing. As a political parallel, Bag Man situates Spiro Agnew next to Donald Trump more convincingly than most of the claims that try to find some version of Trump in history (see the many think pieces comparing him to Nixon, or Hitler). The message — that we have been here before, survived, and might even have a mechanism to deal with a criminal in the White House — is almost comforting to those worried about the rule of law’s strength. Beyond this clear political message, Maddow fills an important gap in the national memory. She points out that many people believe Agnew fell because of some vague allegation of tax evasion. I listened to much of the show with my mother, who was a teenager when Agnew resigned, and she thought the same thing. Many do not remember, or never learned in the first place, that Agnew took hundreds of thousands of dollars of bribes as Baltimore County Executive, Governor of Maryland, and even as Vice President, and Maddow does the important work of reminding us. But Maddow struggles in structuring the narrative of Bag Man across its seven episodes. The show emphasizes the “inside baseball” of law and politics during the Nixon area at the expense of presenting the investigation itself. In Episode 1, we learn that the Justice Department had evidence of Agnew’s corruption. In Episode 2, the prosecutors recount their discovery of Agnew’s crimes but quickly move to their account of informing Attorney General Elliot Richardson of the investigation. The next four episodes wind through the process of forcing Agnew’s resignation, including the inner workings of negotiations, indictments, pleas, and attempts to obstruct justice. In Slow Burn, whose first season chronicles the Watergate Scandal, host Leon Neyfakh moves chronologically through the discovery of Nixon’s crimes and his eventual resignation, making us feel like we are reliving the ordeal with both the public and the legal team. While the series lacks actual suspense (we know Nixon resigns), Neyfakh enthralls us with his measured pace and step-by-step storytelling. Less political podcasts like Last Seen, which investigates the unsolved robbery of the Isabella Stewart Gardener Museum in Boston, can have the same effect. We know the hosts don’t find the art in the end, but we are rapt with suspense because they allow us to “listen in” on their investigations of different leads. In Bag Man, Maddow misses an opportunity to do the same, electing to rush through the actual investigation to focus on Agnew’s response and the process of forcing his resignation. Maddow’s hagiographies of Attorney General Elliot Richardson and Maryland U.S. Attorney George Bell, who oversaw the office in charge of the investigation, are part of this problem. Maddow details the moment the prosecutors took the case to AG Richardson and he decided to pursue it, and the moment that Nixon, Agnew, and the Republican National Committee tried to pressure George Bell into shutting down the investigation. She calls Richardson a man of “unimpeachable integrity” and emphasizes repeatedly that Bell “refused to bow to that pressure” from the Republican establishment to shut down the investigation even though he was a rising star in GOP politics. By emphasizing these moments, Maddow gives warranted praise to these Republican Justice Department officials but spends too much time allowing lawyers to recount their experiences with the politics and legal proceedings of the case, rather than the investigation. Maddow makes the intentions of her moralizing explicit in the penultimate episode when she reads a statement on Bell’s death from then-Maryland U.S. Attorney Rod Rosenstein (yes, that Rod Rosenstein) praising Bell’s adherence to the rule of law. The attempt to assure us that Rod Rosenstein cares about the rule of law comforts those of us breathlessly waiting for the Mueller report and the response of Republicans in Congress and the Justice Department. But the focus on the Justice Department’s handling of the Agnew investigation, rather than the investigation itself, doesn’t make for good listening, and neither does Maddow’s heavy-handedness. By rushing through the riveting story of uncovering Agnew’s crimes, Maddow doesn’t give us room to make our own connections to the present or draw our own conclusions. From the outset, she makes clear that the lesson of the Agnew case has something to do with how we should handle Trump. Bag Man grows a bit more interesting when Maddow arrives at the question of whether a sitting President or Vice President can be indicted. Because Agnew was charged with one count of tax evasion immediately after he resigned (the other charges were dropped as a condition of his resignation), the question of whether a sitting Vice President can be indicted was never answered in legal proceedings. The final episode, a roundtable on the case and, among other things, its implications for the indictment question, leaves the question open. Within individual episodes, the story structure doesn’t always cohere, either. Maddow begins Episode 4 with the story of W. Clement Stone, a self-help author, and his attempt to raise money for Agnew’s legal defense. The episode covers Agnew and Nixon’s attempts to obstruct the investigation. In Episode 6, Maddow opens with Agnew’s fear that Nixon might order his assassination, as well as evidence of sexual indiscretion on Agnew’s part. The bulk of the episode is about the day Agnew resigns. The disconnect between the teasers and storylines leave elements of the case unexplored and the storyline unclear, and the teasers, a remnant of Maddow’s after-the-break musings on cable news, sound like her own interests rather than intentional storytelling. Ultimately, Bag Man is a podcast that adheres to the norms of cable news, with all its diversions and blunt, tell-don’t-show analysis. Cable pundits and hosts look into a camera and tell the world what they think instead of creating a story and allowing viewers to discover for themselves that story’s truth and significance. Long-form podcasts about political scandals, like Bag Man and Slow Burn, are better when they allow listeners to engage in this process of inquiry and discovery. As a cable news host, Maddow has not yet mastered this art. Martin Page lives in New Jersey, where he writes and teaches high school history.